If you’re looking to see some of the major geographical wonders Iceland is known for in person — glaciers, hiking trails, waterfalls, fields of lava rock, volcanoes — Skaftafell National Park will give you all of that and more in one stop. Skaftafell is located within Vatnajökull National Park along the southeastern coast of the country and it’s known around the world for its incredible sights and hiking opportunities. There’s enough in this one area of the country to plan a week-long trip full of outdoor adventures. You’ll want to set aside at least a couple of days for exploring this region. The most popular scenes can be seen in the span of a day, but the hiking is a more dedicated activity. You can even summit Iceland’s highest peak, if you’re in the market for once-in-a-lifetime views. Ahead, you’ll find everything you need to know about getting to Skaftafell, planning your visit, and what to do nearby. Up until somewhat recently, Skaftafell was regarded as its own national park. But in 2008, it became a part of the newer and larger Vatnajökull National Park. Skaftafell originally started out a family farm that was located on what is now the park's campground. As the glaciers shifted, sand started to cover the farm's fields, forcing the family to relocate. The massive volcanic eruption of 1362, demolished all of the farms in the region, giving the area a new name: Öræfi, or "wasteland." Eventually, the Skaftafell farm returned to its original location, once the fields became fertile again. Since becoming a national park in 1967, it has expanded twice (first in 1984 and then again in 2008 when it became a part of Vatnajökull National Park). Today, the park spans 5,460 square miles — a far cry from the 193 square miles the park used to be. Skaftafell is a wonderful place to visit during any season in Iceland. During the summer, you’ll have the best weather of the year to take in the hiking trails. According to the Vatnajökull visitor website, you can join the park rangers on walks through the park between mid-June and mid-August. Easier hiking trails run to and from Svartifoss waterfall and the Skaftafellsjökull, but more experienced hikers can climb the highest peak in Iceland, Hvannadalshnjúkur. If you don’t have a ton of experience hiking or spending multiple days in the wilderness, there are also plenty of private tour companies offering hiking experiences for large groups and private groups. During the wintertime, Skaftafell becomes one of the best places in the Arctic to explore ice caves. To do this, you’ll need to an official tour guide. The ice caves are constantly changing, melting, and caving, and you have to make sure you’re in the company of someone who is tracking all of this seasonal activity. Glacial Guides offers a variety of ice cave tours, as well as glacier hikes, throughout the colder months. You can follow Road 1 all the way from Reykjavik to Skaftafell, but it’ll take about four hours — and that’s without stopping at any of the many beautiful scenes and towns along the way. (You’ll want to factor in at least a couple of hours for waterfall spotting, lunch at Vik, and a stroll along the black sand beach at Reynisfjara. You’ll find a visitor’s center on Road 998, once you turn off of Road 1 and head into the park. You’ll want to research your activities before arriving — much like the rest of Iceland, the best things are often not completely obvious to the untrained eye. When you get there, you’ll be placed in the center of some of Iceland’s most beautiful natural scenes. The region is also diverse; in one span, you'll see snow-topped glaciers, true-blue ice caves, mossy fields and waterfalls. But to do any real hiking, you’ll need to know where to find the trail markers and which route you want to take. The visitor center can help with a lot of this. If you’re taking a guided tour, that will help take off some of the burden of heavy research. One of Iceland’s most-photographed locations is a quick 45-minute drive from Skaftafell: The Glacier Lagoon. Don’t forget to visit the Diamond Beach where smaller pieces of icebergs float onto the beach just across the street from the larger lagoon. 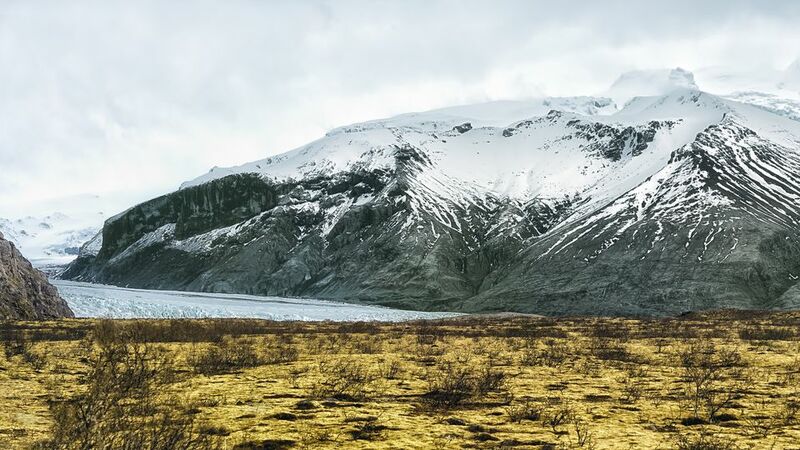 There is a campground in Skaftafell that's open year-round, but note that the visitor center does not offer rental equipment so you'll need to come with all of your gear. Hótel Skaftafell is another popular, and very convenient place to spend the night. Of course, Airbnb is always an option — book early, as rentals fill up fast. Airbnb is often the best (and least expensive) option for larger groups. There are some stunning rentals to choose from (Fossar Cabin is living proof).